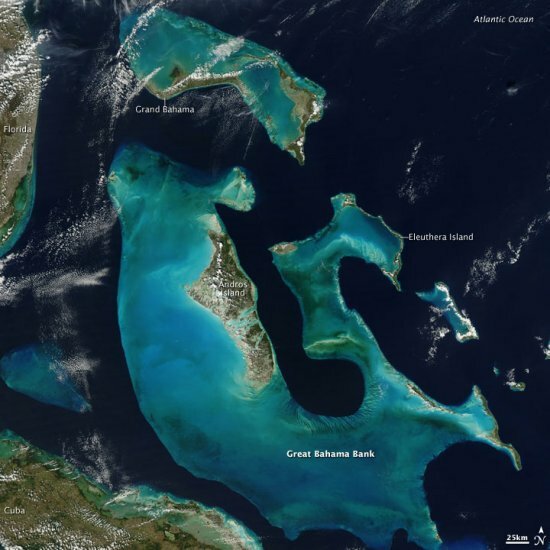 After completing passage of the Florida Straits, Liberty Star, Pegasus and ET-134 will pass west of an icon of human exploration, the mixture of small islands generally believed to be where Christopher Columbus first sighted land in the Bahamas. No one knows for sure which island was the first to be sighted by Columbus, but the prime candidates are Samana Cay, Plana Cays, Grand Turk, or San Salvador Island (named San Salvador in 1925 in the belief that it was Columbus’ San Salvador). With the blessing and financial support of the King and Queen of Spain, Christopher Columbus had sailed from Palos, Spain in early September 1492 and stopped at the Canary Islands, the westernmost of Spanish possessions. Columbus left the island of Gomera on September 6, 1492. Columbus arrived at his Bahamas landfall on October 12, and then proceeded to Cuba on October 28. Columbus continued with the Santa Maria and Niña eastward, and arrived at Hispaniola on December 5, while the captain of the Pinta sailed on his own mission looking for gold. The flagship Santa Maria grounded on a reef on Christmas Eve and foundered the next day. Columbus used the remains of the ship to build a fort on shore, which he named La Navidad (Christmas). Now down to just one ship, Columbus continued eastward along the coast of Hispaniola, and was surprised when he came upon the Pinta on January 6. Columbus’s distress was eased by his relief at having another ship for his return voyage to Spain. Columbus returned to the Americas three more times, but ended his life thinking he had discovered the route to Asia. 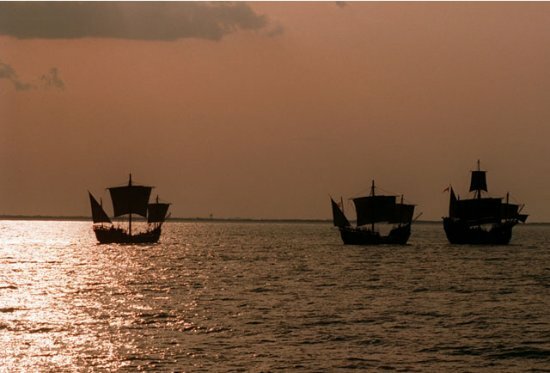 In 1992 in celebration of the 500th anniversary of Columbus’ first voyage to the Americas, replicas of the Nina, Pinta and Santa Maria were constructed, crewed by volunteers and sailed across the Atlantic to reenact this incredible voyage of exploration. 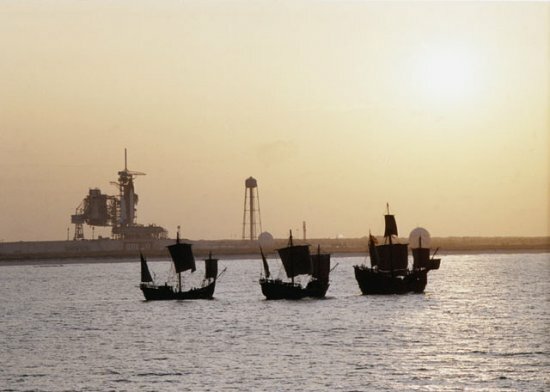 In June 1992 the replica Nina, Pinta and Santa Maria passed the launch pads of the Kennedy Space Center. The picture says it all: old voyagers and explorers riding the wind and seas, passing the torch to the new explorers; and saluting those spacecraft waiting their turn to fly from the Kennedy Space Center. What an unforgettable picture! In June 1992 Replicas of Christopher Columbus’ sailing ships Santa Maria, Nina, and Pinta sail by Endeavour, Orbiter Vehicle (OV) 105, on Kennedy Space Center (KSC) Launch Complex (LC) Pad 39B awaiting liftoff on its maiden voyage, STS-49. The second picture above was taken from the water showing the three ships in the foreground with OV-105 on mobile launcher platform profiled against fixed service structure (FSS) tower and retracted rotating service structure (RSS) in the background. Next to the launch pad (at right) are the sound suppression water system tower and the liquid hydrogen (LH2) storage tank. But Columbus wasn’t finished yet and in fact Columbus’ life and travels in space have just begun. In February 2008 the European research laboratory, a large, fully equipped state-of-the-art science laboratory, was launched on board NASA’s STS-122 mission to the International Space Station. The Europeans named their science laboratory Columbus. 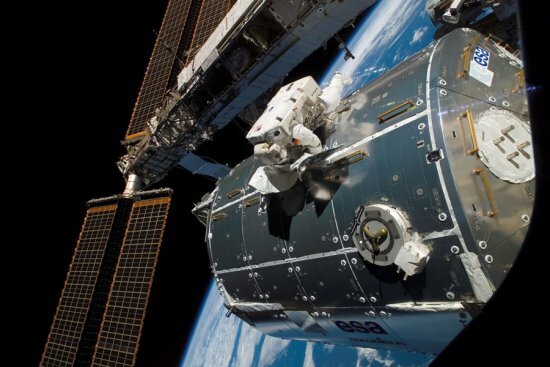 Columbus is a major contribution to one the history’s most amazing partnerships in science and engineering, the International Space Station.